Are you a CERT member? Do you live in San Rafael? Are you looking for more ways to be involved? 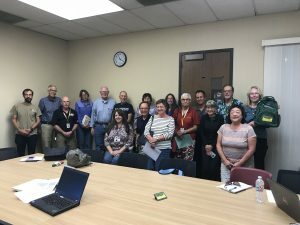 Join the San Rafael CERT steering committee (SRCSC)! The SRCSC is a city-wide volunteer organization providing leadership, organization, and sharing best practices to recruit, train, connect, and continually engage CERT members within neighborhood groups and in coordination with local first responders. Upcoming meetings: February 9th 10am-1pm: Boro Community Center. San Rafael CERT is sponsored by the San Rafael Fire Department and coordinated by the Office of Emergency Services. The Steering Committee has four groups focused on specific objectives. The Outreach and Communications Team is helping to connect CERT members within their neighborhoods, share preparedness information, and recruit new and diverse people to the Community Emergency Response Team. The Planning Team is working to create and update local, city, and countywide CERT plans, including disaster response, communications, and activation procedures. The Training, Drill, and Events team is focused on creating ongoing opportunities for CERTS to learn new skills and practice what they know while supporting the community. Zone Coordinators are being recruited within each CERT response group to help lead local neighborhood efforts and assure best practices are being shared. Looking to become a CERT member? 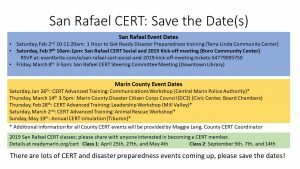 Visit ReadyMarin.org to register for an upcoming CERT class. Email: oes@cityofsanrafael.org for more information or to get involved in SRCSC!